The Noelex 25 is one of the most successful yachts of its size in NZ with over 500 being built. Simple and responsive to sail, well-equipt and very spacious. The lifting ballasted keel makes them sail like a keel boat but gives you the advantage of anchoring in close. Accommodation – Generous double berth forward, port main cabin double, starboard quarter berth. Linen on request. Cookware and tableware for five – two burner cooker. For bareboat charter, the skipper must have a sound knowledge of sailing and boat handling. We provide a comprehensive vessel safety briefing and an overview of navigation in the Bay of Islands, with suggested highlights before you cast off. 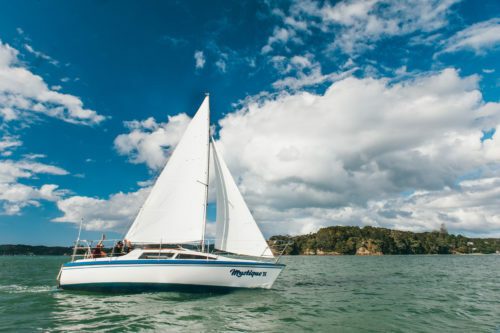 Do you need an instructor to refresh skills and provide guidance on navigation in the Bay of Islands? Just ask us. New to sailing or want the comfort of some time with an instructor before you take the helm. Just ask, we can help. Check out our sailing school courses. Cost: $250 per day, plus fuel as used and optional insurance bond. (During peak times from 20th December to 6th February the cost is $290 per day). There is no minimum hire period but we do charge a small premium for daysails.